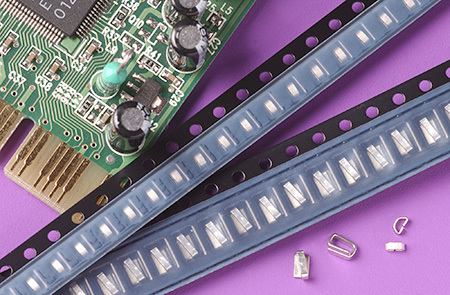 The silver-plated TP-107 Series loop-profile SMT test points offer positive and secure locations for most commercially available spring-loaded test clips and probes while providing a strong bond to the surface mount PCB to accommodate for mechanical stress. The TP-107 Series achieves this through the Helicoil configuration of its flat wire design, resulting in a mounting surface footprint almost double the area of surface adhesion beyond the dimensions of the wire loop material. This bond to the board requires an average 18 lbs. of force to dislodge the test point from the solder pad. TP-107 surface mount test points are available in two formats: bulk packaged and tape-and-reel configuration. The taped version is fully compatible with ANSI/EIA-481 standards. The TP-107 is formed from spring-tempered phosphor bronze flat alloy wire. For increased reliability, the product is available in a .0001 minimum matte tin finish over .0001 nickel underplate, or a .0001 minimum silver over .00005 minimum copper plate. Recommended mounting pad dimensions are 0.185″ x 0.135″. IBS Electronics is a Components Corporation authorized distributor. As a ISO 9001:2008 certified distributor of electronic components you can trust IBS Electronics to offer you the best prices on Components Corporation’s test points and the highest level of quality assurance in the industry.